Pay it Forward was a simply horrible movie. So I sort of cringe to broach this topic because discussions of this nature always remind me of that movie and, well, make me cringe. Nevertheless I came across this piece on The Huffington Post last night and it caught my attention. If we manifest grasping, aggression and ignorance in the smallest details of our interaction with others, these energies gather power and strength like an avalanche. 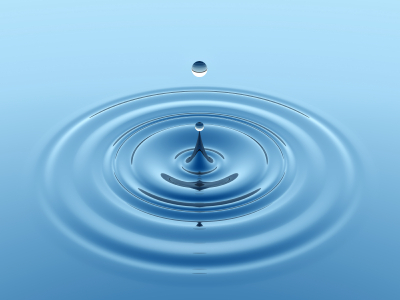 If we lace our smallest exchanges with awareness, courtesy, consideration and compassion, we can create a ripple effect with a different outcome. Nichtern goes on to point out that adding such awareness and compassion to our interactions with others are really just the basic elements of common courtesy. And I think that common courtesy is far too often overlooked. Call me old fashioned (and in some ways I am), but it seems to me sometimes that the world has gotten big enough that we believe we can afford to abandon common courtesy. If we step on someone’s toes today we may not ever see that person again, so why not just look out for ourselves? Perhaps we can get away with this approach for a while, but I don’t think it sounds like a very satisfying way to live. So, in the interest of keeping this post brief, I will part with this thought: do something courteous today. Do something nice for someone who didn’t ask for it. It doesn’t have to be anonymous. It doesn’t have to be significant. Hold a door. Offer someone change for the vending machine. Let the person in a hurry take the taxi you just hailed. Or whatever other opportunity avails itself to you. I highly doubt you’ll regret it. And it might just circle back to you. Sometimes I like to examine my own irrationalities. Lately, in conjunction with all of the royal wedding hubbub, is one of those times. Like many Americans (mostly women, I presume) I have taken a cursory interest in Prince William’s fast-approaching wedding to Kate Middelton. Yet, there is absolutely no reason why I should care. I do not know them. I am not British. Their wedding – other than the onslaught of coverage on TLC – has no bearing on my life whatsoever. And yet, my DVR is set. I took a little cruise around the World Wide Web yesterday to see what other people had to say about the American fascination with this wedding, and not surprisingly there was no shortage of opinions. One Slate writer Mark Oppenheimer called for all Americans to boycott the royal wedding, claiming that our forefathers gave their lives to win us freedom from the monarchy, and that to wax romantic about it today is downright unpatriotic. I think he takes his position a bit far. We aren’t talking about a ruling monarchy. The Windsors are merely symbolic today, and our interest in them has, I believe, more to do with glamour than power. Thomas Paine once aptly pointed out once that a hereditary head of state is as absurd a proposition as a hereditary physician or a hereditary astronomer. And he was right. But thankfully that’s not on the table in this situation. In fact, it is not talent, ambition, intelligence, or even wealth that has made William famous, but fate—an accident of birth. Kate will now share that fate, and that, I reckon, is exactly what makes her wedding so compelling to read about, to write about, and to discuss. … None of us knows exactly how our lives will turn out, but William has a better idea than most—and now Kate does too. So I return to my own motives, which are still not fully clear to me. It isn’t just the wealth that fascinates me. For surely there is no ticket to a life of wealth with more strings attached than marriage into the British royal family. It isn’t just the glamour that fascinates me. For the life of a royal is more than castles and vacations; it also entails a great amount of civic activity and regard for duty. And it isn’t the idea that life as a princess is a fairy tale. For Diana and Fergie made it quite plain what a difficult life that can be. But in spite of all these things, I will record and watch the wedding. And I suppose this is due not to what I know to be true about life as a royal, but due to what I wish were true. We all wish for the fairy tale. We wish for a lavish existence of happiness and grandeur. And we know that on this one day – their wedding day – we will see the perfection we wish could be true in reality. Kate will be ravishing. William will beam. There will be horse-drawn coaches and balcony kisses. We will tune in and see the fairy tale. This time around we know that the couple have taken their time in this decision (eight years to be exact), know each other well, and are hopefully better poised for success than Charles and Diana were. So we feel justified in our giddy anticipation. And we choose, for a day (or a week if you’re really swept up), to believe that this one will work out. *For the record, I think Princess Diana was a fabulous, if flawed, person. I point out her choices here not to speak ill of her, but merely to highlight that fate plays no role in any of this. Holiday weekends usually mean family gatherings. And for us, family gatherings frequently mean road trips. But for whatever reason, we tend to stay put at Easter. It’s the one holiday we always celebrate at home. I have fond memories of my Easters as a child. 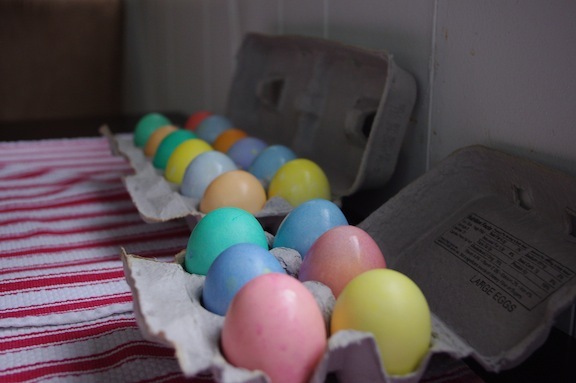 Dyeing and hunting eggs. Hot Cross Buns. Lamb with mint sauce. And new dresses that were always a little too optimistic for warm weather in mid March. Since we got married GAP and I have recreated elements of those Easters each year. We have always had lamb. And since IEP came on the scene we have incorporated some of the more kid-oriented elements of the holiday. As an adult you gain newfound appreciation for all the effort your parents put forth when you were a kid: holidays are a ton of work! Nevertheless, I always find that they’re worth it. Starting on Friday I began my Easter prep work. It was a weekend-long affair and today I’m feeling spent. So rather than wax philosophic about the resurrection, I thought I’d share with you a few photos from our weekend. 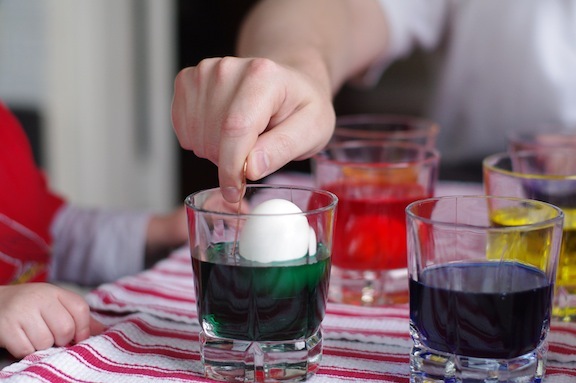 Egg Dyeing 101: How to use the dipper. 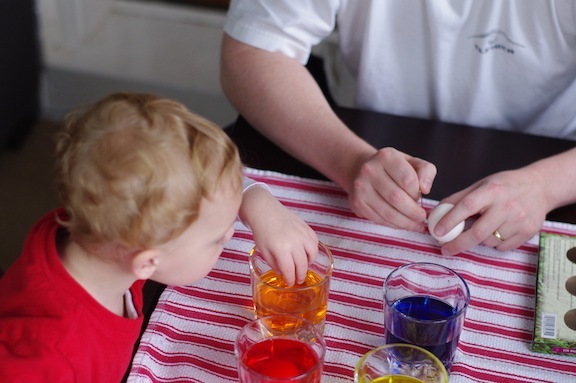 Egg Dyeing 201: Just use your hands, Dad! 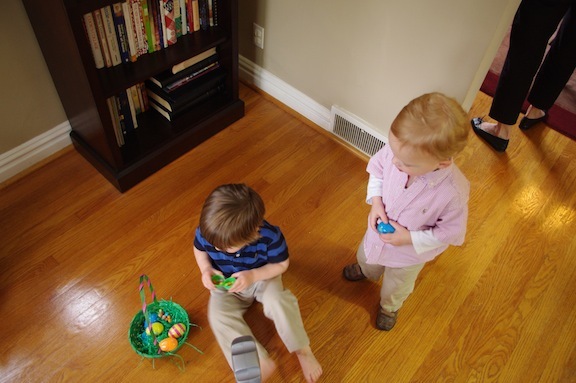 The makings of an Easter egg hunt. It was a long weekend, but I loved every minute of it. I hope your weekend (whether or not it was a holiday weekend for you) was equally lovely. I’ll be back on Wednesday with my next round of thoughts. My mother made Hot Cross Buns on every Good Friday of my childhood. And while I have lovely memories of coming home from school to find a fresh batch on the kitchen counter (sometimes with extra frosting left in the bowl!) my favorite Hot Cross Bun memory comes from my adulthood, and from China. This story is not meant to be thought-provoking or challenging in any way. Rather it is a cherished moment of my life that I felt inspired to share. 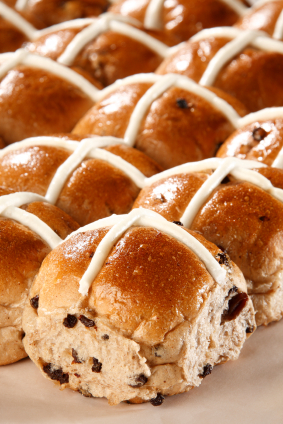 If you’re not familiar with Hot Cross Buns, you can learn a quick bit about them here. I was 26 years old. I was less than a month away from my wedding. I was in Shanghai in the middle of a two-week business trip to my company’s Japan and China offices. So things in my life were pretty calm at the time. Right. I spent each day in a hotel ballroom, giving presentations on the key selling points of my company’s products, changes to the competitive landscape, and pricing and discount structures. I’d eaten all of the local fare that was served and had, for the most part, been delighted by how much I loved it. Cuttlefish, jellyfish, whole roasted fish, seaweed salad, etc. Business dinners each evening featured dishes that rotated among the traditional menus of our distributors’ home countries – Thai, Taiwan, Australia, New Zealand, and Malaysia. I was lost in an international smorgasbord. I’d gone sight-seeing with a colleague one afternoon and eaten dumplings purchased from a street vendor that have never been matched by any I’ve eaten since. The bread was fried crisp on the outside and chewy underneath. The broth inside was rich, salty, and surprisingly hot. It dripped all the way down my forearms and I actually licked some of it off. The bite of pork in the middle was tender and fatty and melted on my tongue. I was in a food nirvana. I was also reaching a saturation point of visual stimulation. Ancient gardens, Confucian temples, giant Buddhas everywhere. My colleague and I had a personal local tour guide for two days who took us into nooks and crannies of her city that we’d never have found (or braved) on our own. I was absorbing the culture around me like a parched sponge. I had moments of homesickness, but for the most part I’d been able to separate myself from the impending wedding and gotten lost in the world around me. And so it was that when Good Friday rolled around at the end of my trip I was barely aware of it. That day our business agenda reached its scheduled afternoon break. I returned to my room upstairs where I looked forward to slipping out of my heels, collapsing onto the fluffy bed, and delicately tearing into whatever scone, éclair, or other confection might be awaiting me. 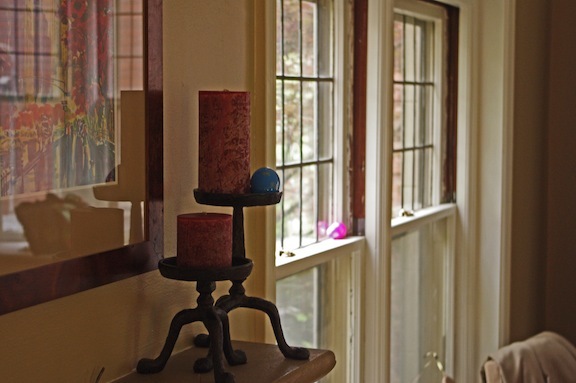 I opened the door, walked into that now-familiar and serene retreat of a room, and stopped cold. There, on the silver tray, was a porcelain plate with two Hot Cross Buns. They were beautiful. Golden dough glazed with egg whites and studded with raisins. Iced by hand with careful, but not perfect, crosses. I was so touched by the gesture that I almost couldn’t bring myself to eat them. But I did. They lacked the delicate crumb and subtle sweetness of my mother’s, but it was irrelevant. I was as far away from home – geographically, culturally, metaphorically – as I’d ever been. And yet a hallmark of my childhood sat before me on a silver tray. I still don’t know the answers to all the questions that spun through my head as I ate my Hot Cross Buns. How did they know these tiny details of Christian culinary heritage? Did they know I was a Christian? Did everyone in the hotel get Hot Cross Buns for their snack that day? Or was it just for the Westerners whom they thought might enjoy a taste of home. Did they have any idea how their thoughtfulness would strike deep to the heart of me? Since I’d left home after college I’d never made Hot Cross Buns of my own. I guess I didn’t realize what meaning they held for me. But in that moment I became keenly aware of their significance; significance to which I’d been heretofore oblivious. The next year I made my first batch of Hot Cross Buns. Neither did they measure up to my mother’s, but they were good. And they were mine. And it felt good to take my traditions into my own hands. I have plenty of time to perfect my technique. I haven’t made them every year. But I will make them this year. I think IEP would like them very much. And I want his memories of them to be as ingrained as my own. *This post was originally published on Good Friday last year. I loved it then and thought it worth recycling this year. Before commencing with today’s post, I wanted to mention that via NYT’s Motherlode blog I was turned onto this article which is an interesting follow up to my post about nature v. nurture in childrearing. Once again, we forget the disadvantaged as we dicker about on problems of privilege. It isn’t long, and I highly encourage you to read it. I don’t typically pay all that much attention to gas prices. 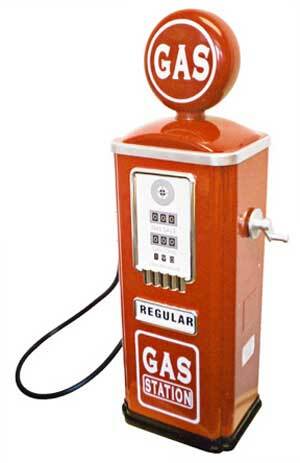 I fondly remember the days when I turned 16 and gas was $0.89 per gallon (that makes me feel really old, by the way). But I consider the two or three dollars per gallon I pay today part of living in suburban America and don’t worry too much about it. However, even I took notice when I filled my tank on Monday and my receipt read $61.56. I’m not the only one raising my eyebrows at current gas prices, but I may be in the minority in that I don’t see anything but regular unleaded in my near future. This is likely due to a couple of factors. 1) My car is paid for, which is nothing to sneeze at. 2) I really love my car, I enjoy driving it, and meets my needs. Given those two conditions, it would take a much bigger spike in gas prices than what we’re seeing today to get me to ditch my current set of wheels. So I was surprised to learn from this short piece on NPR that if gas prices hit five dollars per gallon roughly 78% of Americans would consider purchasing an electric car. The catch is that this 78% isn’t willing to pay a premium for an electric car. Given that electric cars are still substantially more expensive than comparable fuel injection vehicles then the reality is that most Americans fall into my camp and plan to keep their current cars for a while. Nevertheless, I find the statistic interesting. When it comes to the automobile we, as a culture, have been largely reluctant to embrace significant change. And because of that reluctance to embrace change, auto makers have had little incentive to develop it. In the past 30 years we’ve added sunroofs, airbags, CD players, and GPS systems. But the cars we drive today are otherwise surprisingly similar to those our parents drove when we were kids. I wonder, though, if we’re finally reaching our tipping point. Further still, if that is true, are we reaching our tipping point because we can see that a viable alternative is within reach? If significant progress had not been made on electric and fuel cell vehicles in the past five years would we be so willing to consider a future without petroleum-based transportation? Don’t get me wrong. I’m glad to see Americans’ willingness to consider an alternative (and in another three or four years I’ll share it). But I wonder if this is a little bit like realizing you’re about to lose an argument and then suddenly opening your mind to the other person’s point of view. You’re not caving. You’re just enlightened. Riiiiight. I’m not always the biggest fan of the free market. There are certainly instances when it serves us well. But in this case I believe it has set us back at least a generation. We, as the market, did not demand an alternative to gasoline-powered cars because we had abundant and cheap oil and there was no reason to disrupt the growth of our expanding carbon footprint. But now that gas prices are becoming uncomfortable we’re beginning to see that perhaps President Carter had a point way back when. In the long run, I’m glad to see that automakers are preparing for the post-gasoline world, because it’s coming whether we like it or not. I just hope that moving forward the free market, in its infinite wisdom, will consider the long run when it makes its demands. Unlikely, I realize. But a girl can dream. Where, along the plastic surgery continuum, do we leave vanity territory and enter the realm of good parenting? That’s what I’ve been thinking about for the past few days. Last week ABC’s segment on a 7-year-old who had her ears pinned back made the rounds of several other media outlets, getting coverage on both The Huffington Post and NYT’s Motherlode blog, and begging questions about the morality of plastic surgery – particularly in children. 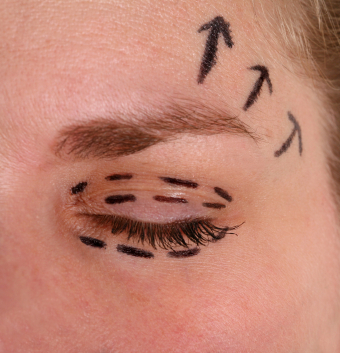 When we think of plastic surgery we tend to think of vanity run amok. We think of people who are too shallow to find value in traits other than the physical. We think of women who prefer to turn back the clock, rather than to age gracefully. But we don’t necessarily think about self-esteem. I suppose it would be an easier issue to tackle if all plastic surgery candidates fit neatly into the stereotypical categories, but they don’t. There are times – in my view, at least – when plastic surgery is the responsible parenting decision. Some procedures provide breast implants. But other procedures correct cleft palates. How do we determine the difference? The story of the little girl in ABC’s profile ties back to bullying. For her, the surgery was a preventive measure against kids’ general meanness, especially as she approaches the adolescent years when children become less tolerant of others’ differences. In her situation I can hardly blame her mother for wanting to spare her years of teen angst, the scarring from which can last a lifetime. But hers is a relatively clean-cut case (at least in my mind). What about kids (or adults for that matter) for whom the reasons for plastic surgery are less universally accepted? I suppose by this logic you could justify any procedure. ”Will I feel better about myself if I look better?” is not a particularly tough requirement to fulfill. And when do we teach our children the lessons about accepting both our good and bad qualities? How do we teach them to accept the physical shortcomings of others if they don’t have any of their own to contend with? And what about plastic surgery’s implicit message that you aren’t good enough as you are? We have created a long continuum for this issue. And we aren’t necessarily all that consistent in how we apply it. If I find this topic to be a minefield as an adult I can only imagine how confusing it must be to kids. I know that there are some cases of plastic surgery that I find unnecessary and fueled by vanity. And I know that I there are other cases that I see as earnest attempts to spare someone a great deal of emotional pain. I suppose it’s a good thing that blanket judgments can’t really be made here. In most cases of plastic surgery we will never know the full story. And without the full story our opinions are probably best left undeveloped. I’ve been on a bit of a Tina Fey kick this week. It started on Monday with Curtis Sittenfield’s essay about Fey in the New York Times. Then on Tuesday I recorded and watched her appearance on Oprah. And on Wednesday, by pure chance, I happened to catch her being interviewed on NPR’s Fresh Air while I was out running errands at lunch. It was this last encounter that I found most interesting. Terry Gross is a fantastic interviewer. While the gravitas of her delivery can sometimes be a bit self-important, she has the amazing ability to render any subject fascinating. She delves into aspects of her guests’ lives and work that are often overlooked in other media outlets. And I always appreciate the depth and nuance of the responses she elicits. Tina Fey was no exception. Ms. Fey talked about many of the expected aspects of her rise to fame: The supportive parents, the make-ends-meet job at the YWCA, the first meeting with Lorne Michaels, her first experiences in front of the SNL cameras, and so on. But it was her commentary on the rules of improvisational comedy that struck me most. As Terry Gross probed about her time in The Second City comedy troupe in Chicago Fey talked about her appreciation for the structure that exists in a scenario that seems (at least to the outsider) to be pure chaos. In particular she mentioned two rules that resonated with me. Rule Number 1 – Make declarative statements. In improv scenes you are supposed to say something. Don’t ask a question. Don’t make a statement with the intonation of a question. Say something – anything – for the other person to respond to. Fey talked about how this is most often a challenge for women. Many women get into that moment on stage and their fear of saying the wrong thing corners them into wishy-washy, question-based dialog that immediately puts the onus on the other person to come up with something real to say. I know that here in the blogging world we tend to be fans of questions. We love to ask questions that don’t really have answers. We love to explore shades of grey and levels of nuance. These are all good things. But I think we are also inclined to use our affection for questions as an excuse for not saying anything definitive. Rule Number 2 – Enter when you’re needed. Apparently it’s a bit of a chore to teach new improv students the appropriate moment to enter a scene. Is it when you come up with something funny to say? No. Is it when the scene is getting funny and you want to be a part of it? No. Is it when you have an idea for a new character in the scene? No. You enter the scene when you’re needed. You enter when you feel it start to lull and when you can tell that the actors on stage need the injection of a new character to maintain their momentum. Applying this rule to my life feels like taking a breath of fresh air. I am not always needed. Quite often the people around me are doing just fine on their own. It is okay for me to sit back until I am actually needed. I don’t always have to be the first person to jump up. I don’t have to participate in everything. I can sit backstage, watch the scene unfold, and enjoy myself. I only need to enter the scene when I’m needed. Figuring out exactly how and where to apply these sketch comedy rules to my life is going to take some thought. But they seem like the kind of rules that ought to be applied more broadly. You know what’s funny? Looking back and remembering how I thought that on Sunday I’d be able to make breakfast for my parents, teach my mom to use Skype, pack, drive 400 miles with a two-year-old, arrive home, unpack, eat dinner, catch up with GAP, and still have any of the mental prowess required to write a thought-provoking blog post. I’m really funny sometimes. At any rate, I apologize for being MIA on Monday and am happy to be back with you today. I have yet to meet a parent whose approach to child rearing approximates this philosophy: “Eh, I’m not too worried. Whatever happens happens. I just want to have fun with my kid.” However, according to Bryan Caplan, economics professor at George Mason University, that’s exactly what we should be thinking. His recent post on the Freakonomics blog, along with his article in the Wall Street Journal, examine new research on the net effect of all our parenting efforts. 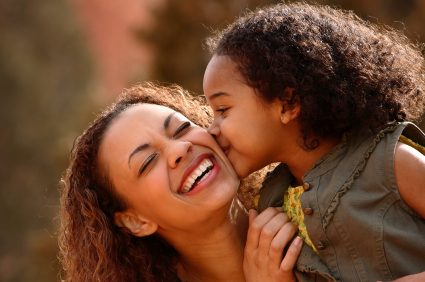 Citing a new study that examined forty years’ worth of parenting outcomes, he points out that, “Health, intelligence, happiness, success, character, values, appreciation – they all run in families. … Kids aren’t like clay that parents mold for life; they’re more like flexible plastic that responds to pressure, but returns to its original shape when the pressure is released.” Apparently our kids are who they are. If our genetics are solid and we turned out okay, we can expect roughly the same for them. Easy peasy. Could this forever put to rest the nature vs. nurture debate? I doubt it. (We seem to love that debate.) But it does bring to light some interesting questions about how and why we break our necks to raise perfect children. If our own genetic makeup sets our children on a particular course, then why do we fret over which preschool and which toddler tumbling class and how to shuttle our kids between slews of extra-curricular activities? 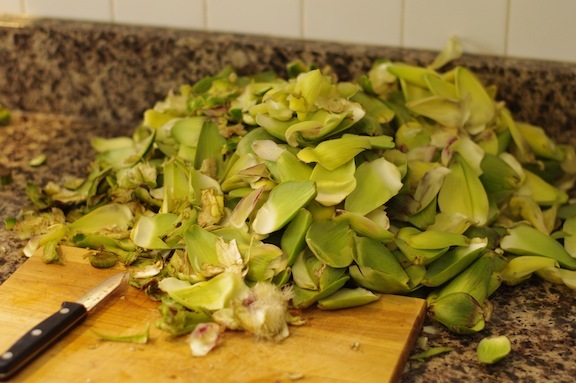 Why do we stress ourselves out in power struggles over vegetables? Why do we worry about how much time our kids spend playing video games? Perhaps it’s foolish of me (especially in the face of actual research), but I still contend that these things matter. We may not need to run ourselves ragged to the extent that we do, but we do need to set an example. Our kids learn from us. They learn how to eat a healthy diet, how to treat people, how to deal with anger and frustration, and how to cultivate themselves. I suspect the research would tell me that my kids are going to pick up these things anyway, just by carrying my genes around in their DNA. Even people who give more credence to the nurture side of the equation would probably say that as long as I myself am eating a balanced diet, treating people fairly, dealing with anger and frustration appropriately, and engaging in personal development, then the kids will get it all anyway, and without a lot of extra meddling from me. And apparently, whether or not they find their relationship with me happy and rewarding is the only longterm influence I have over their success. This is why economics fascinates me. It forces us to confront our own irrationalities. (Confronting other people’s irrationalities is more fun, though.) Here I sit, reading two posts by someone who knows what he’s talking about and who is citing 40 years’ worth of conclusive research, and I still want to run myself into the ground as a parent even though I know at an academic level that it won’t make an iota of difference. Perhaps I am every bit as crazy as GAP has been telling me all these years. Here’s the kicker for me, though: Caplan’s way sounds a lot more fun. It sounds much more enjoyable to just kick back with your kids and have a good time than to be on a nonstop mission to perfection. Granted I’m not of the persuasion to put my kid on the Ivy League track as a toddler (IEP is two and a half and hasn’t been enrolled in a single formal class). But I can sense that increased pressure is on the horizon. How will I handle it in preschool and kindergarten? How will I handle it in grade school and junior high? And how will I handle it in high school, when college and “the real world” are within view? Obviously, I don’t know. But I will bookmark Caplan’s article to serve as a reference point, lest my own irrationalities get the better of me. There is something about springtime that makes us wake up and appreciate the new life around us. We see trees and flowers bloom. New bunnies and birds flit about our neighborhoods. 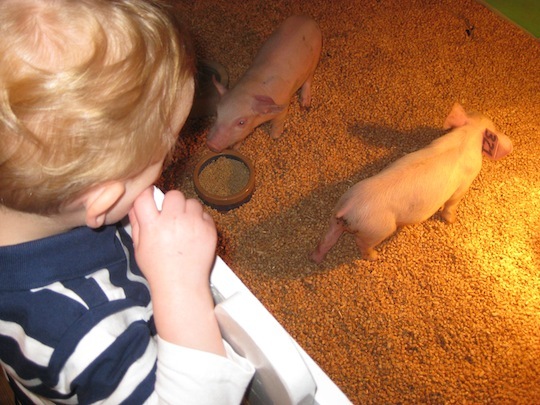 And, for those of us who live in cities, we take our kids to see baby livestock. 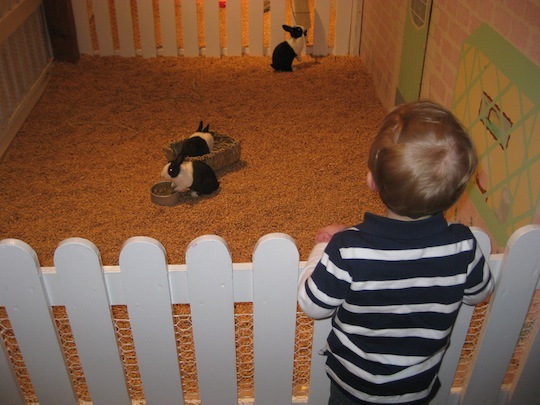 We go to petting zoos and look at rabbits. 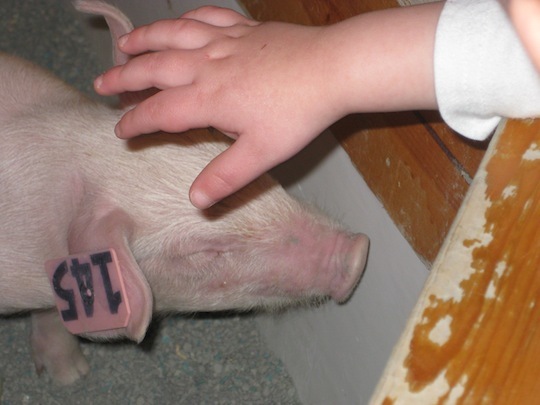 We show tiny piglets to our tiny children. 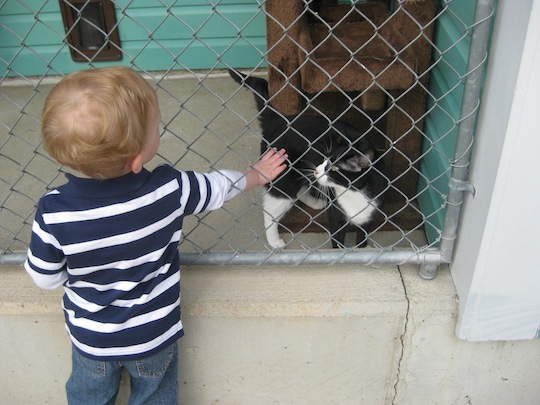 We encourage them to reach their sweet little hands out to pet their new friends. And somehow we live vicariously through their curiosity and wonder. We think about what it must be like to experience these things for the first time. Yesterday afternoon IEP and I drove six hours to my parents’ house. They have a place in the country about an hour outside of town. It is home to horses and chickens and sheep. And at about this time every year the sheep have their babies. 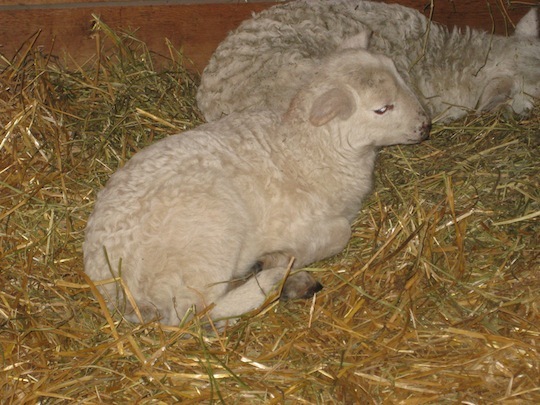 The first lamb was born this week and I want IEP to experience the farm in the spring. I want him to see and touch a newborn lamb. I want him to run around in fresh grass and wildflowers. I can’t tell you precisely why I want these experiences for him. But it seems important to me. Important enough to spend 12 hours in a car with a two-year-old who likely won’t remember much of this particular visit as he grows up. New life is precious. We know it the moment we see it or touch it, even if we can’t express it in words. *The photos above were taken by Nanny at a commercial farm in our area yesterday morning. 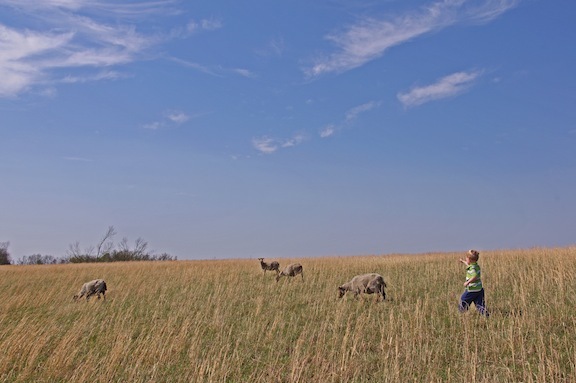 Our family farm outing will happen this weekend.